Chapter: SCIENCE EXPERIMENTS & AMUSEMENTS FOR CHILDREN BY CHARLES VIVIAN. Simple Technical Steped Practical Projects for school and college students. You will need: Two glasses, cotton, water. SCIENCE EXPERIMENTS & AMUSEMENTS FOR CHILDREN BY CHARLES VIVIAN. Simple Technical Steped Practical Projects for school and college students. You will need: Two glasses, cotton, water. Scientists know that even in solid objects there are many minute spaces between the small particles of matter, which they call 'molecules.' This simple experiment proves there are spaces. What happens? Start with the two glasses. Fill one with water, the other with absorbent cotton. 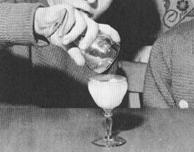 The photo above shows the two glasses arranged: one filled with water and the other with cotton. Now slowly pour the water over the cotton, until one glass successfully holds the contents of both glasses. (See photo below.) Of course you cannot see that the molecules of the water and the wool are now filling the minute spaces that were formerly empty, but you have proved it. Before children can understand a thing, they need experience: seeing, touching, hearing, tasting, smelling; choosing, arranging, putting things together, taking things apart. Experimenting with real things. Old-time school teaching used only words and the teachers thought children knew something if they could repeat it. Now we know better. To reach practical understanding we do not need to use many words with young children. Children are clever. They learn a lot, without being taught. The greatest skill - to be able to talk, to communicate is learnt outside school. In the classroom it's the children who need to talk the most. Unfortunately it is the teacher who does most of the talking! What is the Relationship between Climate Change and Weather?